Art / Knowledge / Theory is a book series that explores artistic modes of expression as forms of knowledge production. It focuses on transdisciplinary, epistemological and methodological approaches to contemporary art. Linking artistic and scientific practices, tools, techniques and theories, the volumes investigate the cultures of aesthetics and science studies as they relate to works of art. Art / Knowledge / Theory analyzes the role of art in contemporary culture by probing the philosophical, historical and social parameters by which images are accessed and assessed. As an amplification – as well as intervention or even a correction to historical research, this series questions the state of the art and knowledge within a culture, characterized by technology and science. This volume focuses on notions of embodiment as they relate to sexuality, aesthetics, epistemology, perception, and fantasy itself. What function do fantasies and their images possess in relation to art as a form of knowledge production? Approaches to modes of fantasies are explored beyond traditional conceptions to include complex thinking processes, subjectivity and inter-subjective experiences. 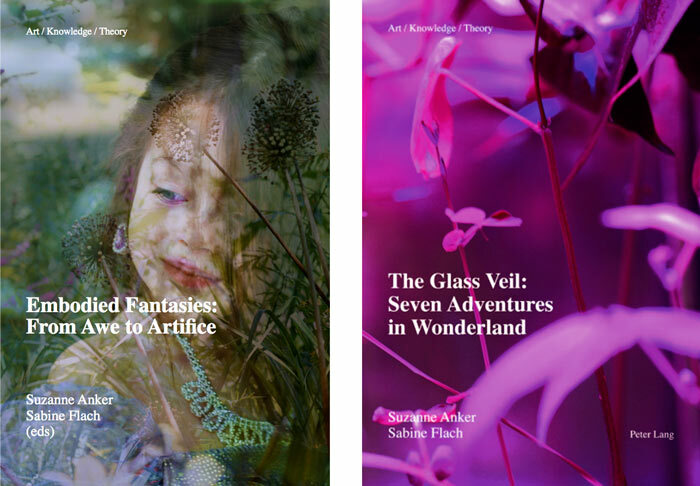 n this collaborative work between artist and theorist Suzanne Anker and art historian Sabine Flach, the study of image production unveils the reality of pictures beyond their function as mere representation of the world. The visuals range from firsthand accounts of specimen collections in historical medical museums, scientific research laboratories, as well as astrocultural studies of plant propagation among other themes concerning life forms. Focusing on systems of artistic knowledge, the authors demonstrate how context, scale and framing devices alter meaning in pictorial representations. Somatic responses, classification networks and image banks are explored as they relate to intersections in visual art and the biological sciences.